Boat shoes are hard soled boots that are made of neoprene material. They are easy to put on and require very little force. They are a little more difficult when wet, but still manageable. They feel good to wear as they press into your skin and makes them feel so snug. They work similarly to a wetsuit as in they take water in, but don't let it out. The heat of the foot then warms up the water inside the boot and your feet at protected. They are also useful for walking around, since they protect your bare feet, when you wear a wetsuit, and the plastic covering that goes on top of a dry suit, which would otherwise trail on the ground. Of course you can just wear normal shoes, but boat shoes can get wet and will not fall apart. 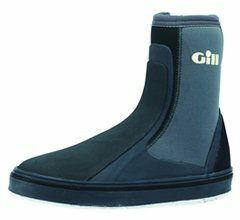 Also normal shoes do not have the superior grip needed to tackle wet, slippery surfaces that are found on dinghies. The only thing about them, is that when they get wet they make your feet absorb the water, just like what happens when you are in a bath for too long, so make sure that you take them off at intervals during your sailing to let your feet return to their normal dry state. The boots are tough, sturdy and are very useful in sailing, so it is very important to get a pair, otherwise you will have a very miserable time sailing.